$2,000 cash for travel to use for air, car or island hopping! Winspire booking & concierge service. Subject to availability and one year to book your trip. The Fairmont Kea Lani Maui rests gracefully on Polo Beach, on the southwest shores of Maui. With a sandy bottom and clear water, it is ideal for snorkeling and discovering tropical fish and turtles swimming near the Wailea Point reef. 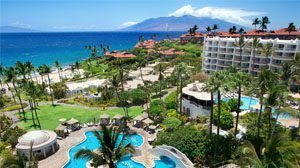 The resort is located close to Wailea’s five championship golf courses with spectacular ocean views.